Way back in July 2014 we delivered a Foundation to Canine Massage workshop to a group of dog groomers in Pevensey (pictures here). 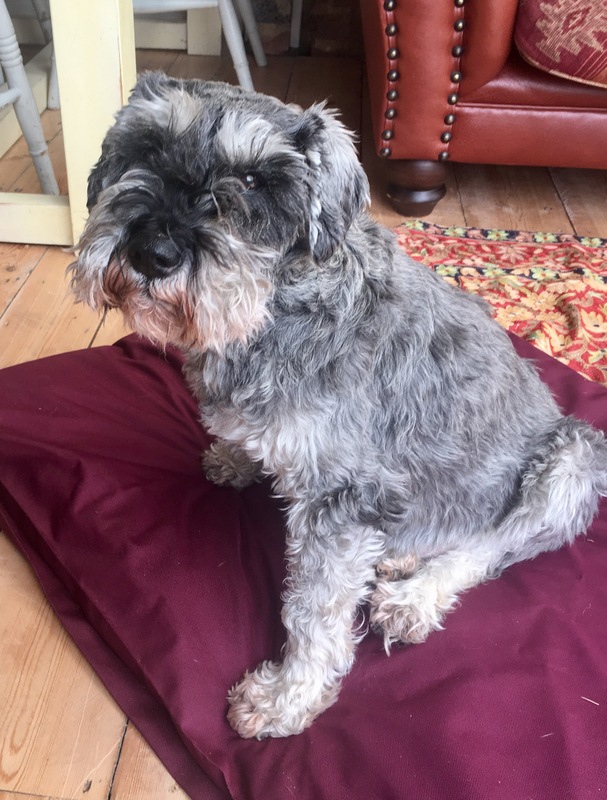 This week I had a call from someone who had attended asking for my help with her senior Schnauzer who now needs a bit of help with his back legs. The vet gave me a full and clear outline of his recent history and issues which started last October when he started to limp on both rear legs but particularly the right. The vet found his right knee had a distinct Drawer and suspected a cruciate issue. Due to his age and the fact he did not seem uncomfortable with weight bearing, it was decided to treat this issue without surgery but with medication. In a dog with no cruciate issue, the joint should only work like a hinge – bending up and down because the healthy and strong cruciate ligaments hold it in place and prevent it from going in any other direction. When these ligaments have broken or become stretched, the knee can also be made to move forward and backwards. This is the vet meant by ‘Drawer’ and if you look at some of the YouTube videos of this test, they look very uncomfortable. In Sweep’s case, a subsequent investigation from the vet in December appeared to show that the Drawer effect had lessened on the left side but he did have pain in both his knees and hips. It was most likely that he hadn’t snapped his cruciate but that the tendons had stretched so the joint had become floppy which has altered his balance. Now he was on reduced exercise, which started him on the vicious cycle of losing muscle strength in the rear while overloading the front. Time for massage and exercises and a visit from Dr Les. The wastage in his rear legs was noticeable and he was wobbly here – preferring to sit side-saddle (see picture) rather than on his haunches. His massage session started in that position until he gradually realised this was helping and lay down on the mat for me. 90 minutes later he was still there…. Luckily he loves his treats and with the help of some sprats I was able to devise some exercises he can do with his Mum to try and build up those back leg muscles and restore his confidence. It certainly seemed to do the trick as after this time he stood up with more confidence. “He has the spring back in his step” his Mum said. Hopefully we can help to restore his quality of life with the massage and exercises and help him to walk without a wobble. 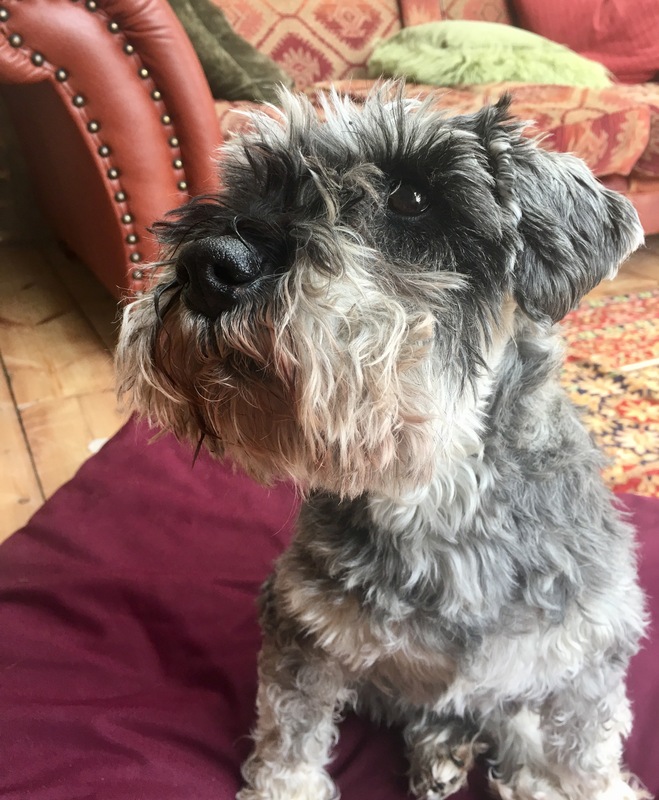 This entry was posted in AchyPaw, achypaw myotherapy, Brighton Dog Massage, canine arthritis management, canine myotherapy, canine myotherapy, dog myotherapy, achypaw myotherapy, myotherapy, achy paws, Dog, Dog massage, Drawer Test, injury prevention, Saltdean, south coast dog massage, south coast myotherapy, Testimonial, therapeutic massage and tagged achypaw, achypaw myotherapy, achypaws, arthritis management, Brighton, Canine massage, canine myotherapy, Dog massage, dog muscle therapy, galen dog massage, prevention, south coast dog massage, therapeutic massage. Bookmark the permalink.